The advantage of digital photography is that you can take hundreds of pictures on to the digital memory cards and if you run out of space all you have to do is buy more cards to save more images. Once you’ve taken all these hundreds of pictures though you need to move them from the cards so that you can safely store the images and begin to reuse the cards. Getting your images onto your PC is a very simple task that’s been made all the easier by computer and camera manufacturers coming together and deciding upon a standard protocol from moving images from one to the other. The simplest thing to do is plug your camera directly in to your computer. Every digital camera is supplied with a cable to let you attach it to your PC. It is usually a USB cable at one end and a small mini-USB camera connection at the other. All you have to do is turn the camera on and connect the cables and your computer should ask you if you want to transfer the images to a folder or directly into an application. You might have to select an option on your camera when you plug it in the first time but after that transfers should be automatic. The problem here is that you’re using the camera’s power to transfer the images so you’ll be draining your battery by using this method unless you keep the camera plugged into the mains at the same time. One method of saving your camera’s battery is to invest in a card reader. 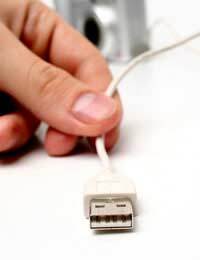 This plugs into a USB port on your PC in the same way as the cable method above. Then you remove the memory card from your camera ad put it in to the card reader. The computer will react in the same way it would had you plugged a camera into it directly and ask you what you want to do with the contents of your memory card. The best thing about this method is that it uses the USB power so there’s no need for external power adaptors and sometimes they are faster at transferring files to the PC. Some cameras offer wireless methods of transferring images. If you’ve got Bluetooth or Wi-Fi on your camera you can transfer the images this way. It takes a little tinkering to get this kind of transfer set up but it does stop you having a spaghetti junction of wires on your desk. The disadvantage is that transfer speeds can be slow and sometimes unreliable. Once you’ve moved your images from your camera to PC remember to set aside some time to organise all those images and make sure you back them up to CD or DVD before you delete them from your memory cards. There’s nothing worse than losing your images and it’s very easy to back them up. Transferring your images should only be the first step.